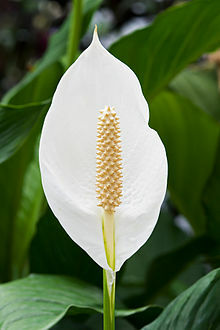 Peace Lily (Spathiphyllum cochlearispathum) clearly showing the characteristic spadix and spathe. Araceae are a family of monocotyledonous flowering plants in which flowers are borne on a type of inflorescence called a spadix. The spadix is usually accompanied by, and sometimes partially enclosed in, a 'spathe' or leaf-like bract. Also known as the Arum family, members are often colloquially known as aroid. This family of 107 genera and over 3700 species is most diverse in the New World tropics, although also distributed in the Old World tropics and north temperate regions. These plants often have rhizomes or tubers with calcium oxalate crystals or 'raphides' and commonly with milky sap. The leaves are alternate, simple or compound, petiolate, sometimes very large, and usually with a sheathing base. ↑ Bogner, Josef; Johnson, Kirk R.; Kvacek, Zlatko; Upchurch, Garland R. Jr (2007). "New fossil leaves of Araceae from the Late Cretaceous and Paleogene of western North America". Zitteliana 47: 133–147. This page was last changed on 14 May 2017, at 23:18.